The AFC South should be very competitive in 2017. The Houston Texans are the favorites, while the Tennessee Titans are one of the most hyped teams this offseason. If Andrew Luck can stay healthy, the Indianapolis Colts are always a potential playoff team. For the Jacksonville Jaguars the question is, how many games will Blake Bortles start this year? 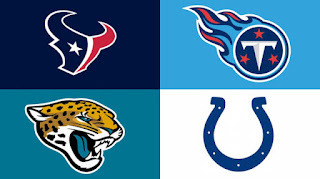 We wouldn't be surprised if the Texans, Titans and Colts split all of their games this year but we are putting our money on the Colts being the only team in the AFC South to beat the Texans. Indianapolis has lost 3 straight after winning 3 in a row against Houston, who is 6-0 against Jacksonville since 2014. The Titans have struggled in recent memory against that Texans defense. Tennessee also struggles with Jacksonville, splitting their last 6 games. Oh, and they haven't beat the Colts since 2011! The Jaguars have won just five games in the division since 2014. Houston has a rough start to the season with games at Cincinnati, New England and Seattle in the first 8 weeks. The Colts also have to play the Seahawks and Bengals on the road. The Titans and Jaguars road schedules looks nice, outside of games in Pittsburgh. The Texans will host the Chiefs and Steelers. They get three straight home games from weeks 4-6 before their week 7 bye. Tennessee's schedule gives them back-to-back home games in weeks 9-10 and to end the season in weeks 16-17. They will host the Raiders and Seahawks in two of their first 3 games. The Colts will host the Steelers and Broncos in the second half of the season. Jacksonville will host Cincinnati, Seattle and both Los Angeles teams.